This is it! The most important aspect of your pool. The ‘spark’ in most pool ‘family feuds’! What colour pool interior to choose! ?Well, rest assured, you have come to the only place on the net with so much information and help on this major, yet simple topic. When talking ‘pool interiors’ its important to break them down into two main categories, cement based and ‘artificial‘. If you have done a little research about pool builders/ renovators, you will find a very large trend. Over 90% of them only use cement based surfaces to line a pool. Artificial surfaces are what we consider things like epoxy paint, vinyl and fiberglass. These surface types usually don’t compete on the same durability scale as cement based finishes, some of them only lasting 2-4 years. There are two main categories in cement based pool finishes; Exposed and Quartz surfaces. EXPOSED FINISHES: These surfaces are completed by mixing the material on site, rendering it to the pool interior surface, and just before it goes dry its exposed using water to remove the excess cement on the surface revealing the stone or glass beads below. This is the most consistent finish method as exposing takes place the same day before the mix hardens so a nice even finish is achieved. QUARTZ FINISHES: The finish types are completed by mixing the material on site, rendering it to the pool interior surface, and coming back the next day when interior is completely hard to expose the fine stones below using an acid and gernie clean. This too is a beautiful surface but is not designed to be as consistent as an exposed finish, so its likely you might see areas where the below quartz is highly visible and areas where not as much quartz is visible. Its also possible you may have slight acid run marks depending on how well the pool shell structure was installed. These marks do fade out over time but are usually out of the applicators control. These finish types consist of products like the old marble-sheen, Quartzon and Q-Quartz. Pebblecrete is the mixture of pebble and cement bonded together and applied to the swimming pool shell. It comes in many different colours, shape’s and sizes.Older methods of pebblecrete where harder to clean and rough on your feet and knee’s. Conventional designs and adaptations mean that todays pebbles are smaller, smoother and easy to clean. There are many pebble manufacturers today, some local – some imported. They each offer their own colour styles. Pebble comes in three main sizes, the original 3-4mm, standard 1-2mm and fine 1mm. The most recognised size among applicators is the 1-2mm as it offers very high strength and still remains smooth and soft on the feet. 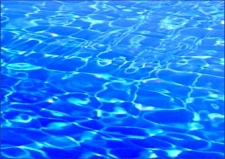 When selecting a pool surface colour there are many factors to consider. Its best to speak to someone who is true to their word as many installers will show a sample of the colour on a small swab and wont give you an idea of what final water colour will be achieved. The bottom line is, the darker the base of the product the darker the water colour will be. What is the base? Surfaces are are mixture of two main components; cement and the pebble/bead. Cement naturally comes in three main colours, white, off white and dark grey. The majority of pool interiors use white cement as it improves strength and workability, but white cement gives off a very light water colour, so an oxide must be used to change the colour of the cement to help darken the water to a deeper blue. Most clients will see a sample of a ‘New Zealand white pebble with 25% blue flecks’ and assume they will get a nice blue water colour, when in truth the water colour does not come from the blue flecks but from the white base. So in truth the final water colour will be closer to a very light blue, almost aqua colour. Other factors to consider are sun and shade spots. Depending on the amount of light your pool will receive, will determine on the true colour. If you were to see a photo of the same pool on a nice sunny day and another on a dark gloomy day, you would most likely think that the pool interior installed is completely different from photo to photo. 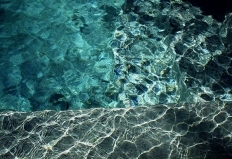 With the technology of the pool equipment today its worth spending that little bit extra on things like PH and CL controllers (automatically dose the pool when running low on acid and chlorine) and changing the filter media every 7-8 years to help ensure a splendid pool surface and improve quality of pool enjoyment.